No clicking? What is this madness? The console version of Diablo 3 provides many new ways to play the game cooperatively. Here is our breakdown. How many players can play Diablo 3 locally (couch co-op)? How many players can play Diablo 3 via system link or LAN? How many players can play Diablo 3 online? How do I begin a co-op session in Diablo 3? Can I drop into a game of Diablo 3 locally, or do I have to start from the menu? How is game difficulty handled in Diablo 3? Can I join my friend in a different difficulty than what I've been playing on? How does save game progress work for co-op play in Diablo 3? Can I join a game if the host is further along than me in Diablo 3? What happens in Diablo 3 when I bring up a menu or my inventory in local play? Can other players continue to play? Is there a real-money auction house in the 360/PS3 version of Diablo 3? 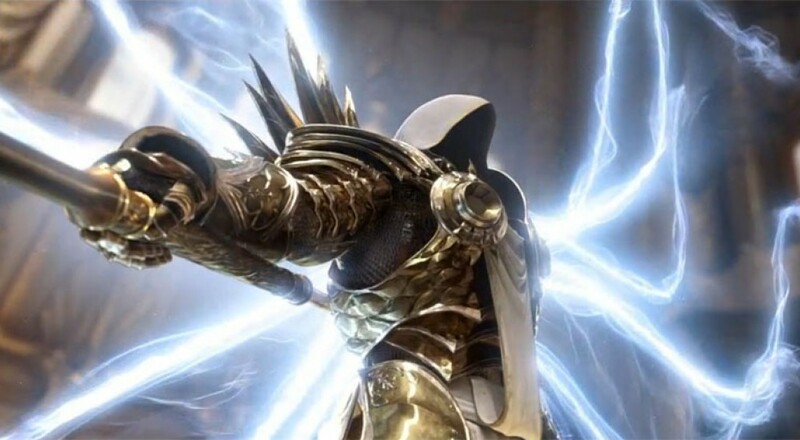 Up to four players can play Diablo 3 locally in shared-screen. Diablo 3 can be played in local co-op offline. Up to four players can play Diablo 3 in LAN/system link. This can be set in the Network Settings either when creating a game or when already inside of a game. Up to four players can play Diablo 3 online together. Diablo 3 supports up to four players in combo co-op, with any variation of local/online players. Yes, if the player wants their character progress to be saved. Players 2-4 can sign in as guests to play online, but their game won't be saved. A Gold account is not required for saving character progress in local or LAN play - a silver account will work for offline purposes. All games in Diablo 3 can function as a co-op game. Players can join open games through a matchmaking system or join friends' games online. When in a personal game, players can change the network settings to make the game offline, friends-only, invitation-only, or public. Players can drop into a game that's already in progress locally simply by pressing start on the controller. From there players will be prompted to sign into an account and select a character. To leave a game in progress, players can hit "start" and use the "drop out" option in the menu. There are two types of difficulty in Diablo 3. "Mode" is progression or level difficulty (which is also supported in the PC version) and is denoted by the names "Normal," "Nightmare," "Hell," and "Inferno." Players must beat all acts of the campaign in order to unlock the next mode difficulty, then start from the beginning again. Enemies will be of a higher level and difficulty. "Difficulty" is game difficulty (new to the console versions of Diablo 3) and is denoted by the names "Easy," "Medium," "Hard," "Master I," and "Master II." On higher difficulties, enemies will hit harder and have higher health. On Master I and Master II difficulties, players will enjoy increased gold and magic find. These two difficulties are unlocked after a short time of play. There is no interaction between "Mode" and "Difficulty," other than players can set them to whatever combination they please. The tracking of quest progress is tied to characters. When a game is started, the host is in charge of which act and quest are currently active for the game, and can pick any that he or she has unlocked for that mode. As long as players have the current mode unlocked on their characters, they can join any game in that mode, even if it's further along. If players do not have the mode unlocked, they cannot join (e.g. characters that have not beaten "Normal" cannot join "Nightmare" games). Only one player can be in the normal game/inventory menus at a time. Other local players cannot continue playing as the menu takes up most of the screen. Local players will have to wait their turn for inventory/skill management. Any players connecting online will receive no interruption of play. If there are no online players, the game will pause when any local player is in a menu. If there are online players, the game will not pause. In local play, item drops are shared. Online players will see their own set of drops. In combo co-op, online players will receive their own drops as usual and local players will continue to have shared drops. Players can freely trade items between each other by dropping an item from their inventories. They can also trade gold. No, the 360 and PS3 versions of Diablo 3 do not have an auction house, real or virtual money. As a result, the item drops have been tweaked to be of higher quality overall, so players can self-sustain themselves. Voice chat is supported between party members. There is no in-game text chat.